Substitutions: Do you need suggestions to swap out an ingredient? Click here. Choose Gluten Free, Non-GMO, & Organic Ingredients. One pkg (10 oz) Hershey’s Kisses. Remove the paper and foil for the amount of cookies you make. 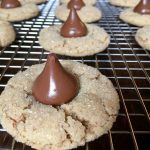 You will need about 48 Kisses for this recipe if rolling cookies that weigh 15g each. Please read prep note above before you begin, thank you! Step 1: Whisk together the dry ingredients in a medium sized bowl. Set aside. Step 2: In a large mixing bowl, or the bowl attached to the stand up mixer with paddle, add together softened butter, nut butter and sugars. Cream together using an electric mixer set to medium. Turn mixer off and scrape down the sides of the bowl. Step 3: Add the egg, milk and vanilla. Beat on medium until well blended. Turn the mixer to low and gradually add the flour mix. Blend until flour is fully incorporated. Turn off mixer, scrape down sides of the bowl, and cover. Refrigerate for about 1 hour. Preheat oven to 375 degrees Fahrenheit (191 C). Place parchment on baking sheets if using. We do not need parchment with our USA Pan silicone coated cookie sheets. Step 4: Remove dough from refrigerator and roll into 1″ (2.5 cm) balls. Or weigh each ball to about 15g or .5 oz (this is what we do.) Roll dough balls in sugar or leave them as is and place them 2″ (5 cm) apart on the cookie sheet. Step 5: Bake cookies for about 6 minutes. Cookies will appear puffy and light brown. Remove from oven and place a Kiss in the center of each cookie. Bake for 2 -3 more minutes or until edges of cookies are a light golden brown. Step 6: Remove from oven and allow to cool on the pan for about 3-5 minutes. Transfer to a cooling rack to continue cooling. Store in an airtight container for up to two days, or freeze for up to a month. The nutrition information provided below is for the recipe as written using organic, unsalted almond butter, milk chocolate Hershey’s Kisses, and omitting the sugar for rolling.